Mount Cook is the highest mountain in New Zealand and is named after the famous explorer James Cook, who discovered New Zealand in 1770. In Maori, the indigenous language, this magical mountain is called Aoraki. 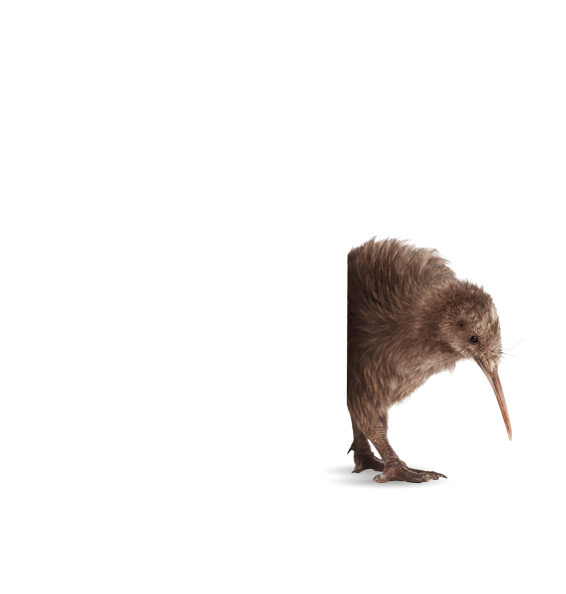 In the local dialect of Kai Tahu this loosely translates as "The Cloud Impaler". This magical and sacred mountain, which today attracts athletes and tourists from around the world, has an overall height of 3754 meters above sea level and dominates the islands of New Zealand. For the Maori people Mount Cook is worshipped as a guardian and protector that connects earth to heaven. The varied landscape of New Zealand has a soothing and refreshing look. This captivatingly pure nature, with meadows, forests and snow-capped mountains is an unforgettable experience for every traveller who visits these shores. It is impossible to miss the abundance of cows grazing contently, whose milk gives Mt COOK ice coffee its unique and unforgettable taste of true New Zealand nature with a touch of adventure from the times of the intrepid explorer, James Cook ... Taste the magic of New Zealand, whenever you want! 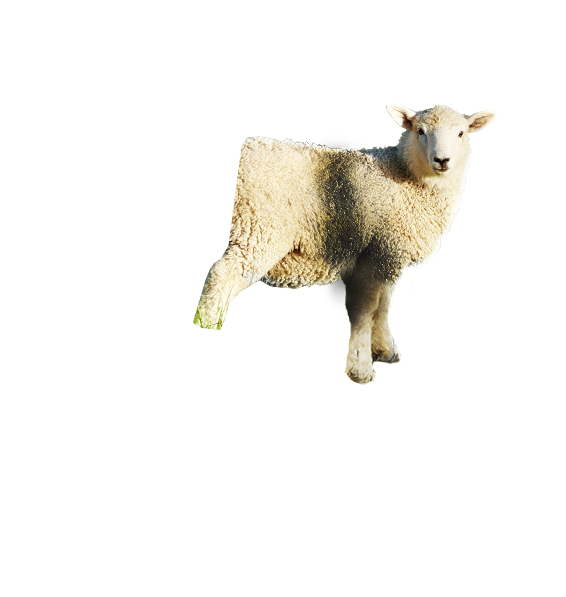 Creamy soft, pleasantly cool and soothing. 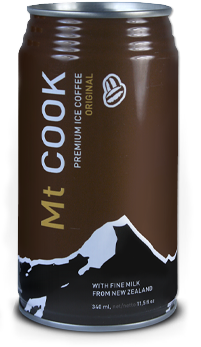 Perfect taste of iced coffee in the style of the snowy peaks of the highest mountains in New Zealand. Just as the snow from the peak of Mount Cook slowly melts towards the mocha brown coloured foot, this ice coffee will slowly melt in your mouth arousing a magically poetic sensation combined with exquisite aromas and flavours ... First, icy cool and refreshing, followed by the taste of the finest coffee and ultimately a pleasantly soothing experience. 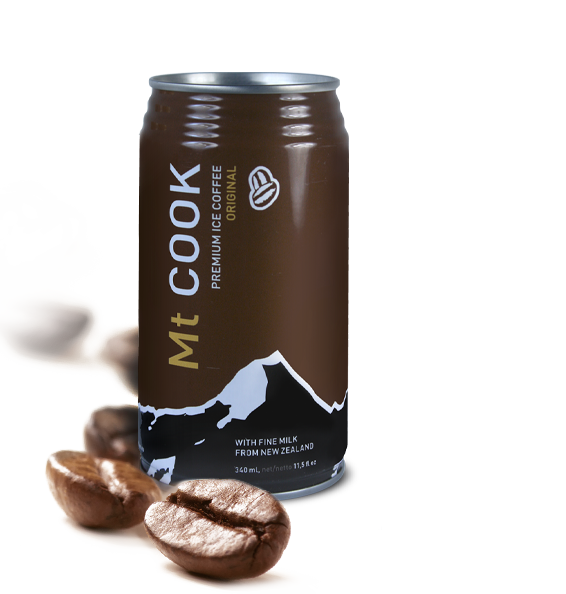 Local milk from New Zealand gives Mt COOK ice coffee its unmistakable aroma and flavour. This exquisite blend of Italian cappuccino and the energy of the icy mountains of New Zealand creates a perfectly balanced, harmonious taste. 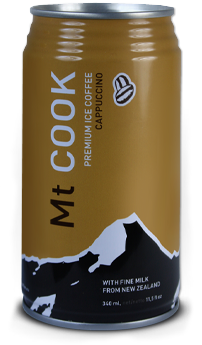 Experience true passion with Mt COOK Ice Coffee Cappuccino. In each delicious mouthful you will feel the refreshing energy of the snow-capped peak of Mount Cook, followed by the warmth of the sun-kissed shores of New Zealand ... 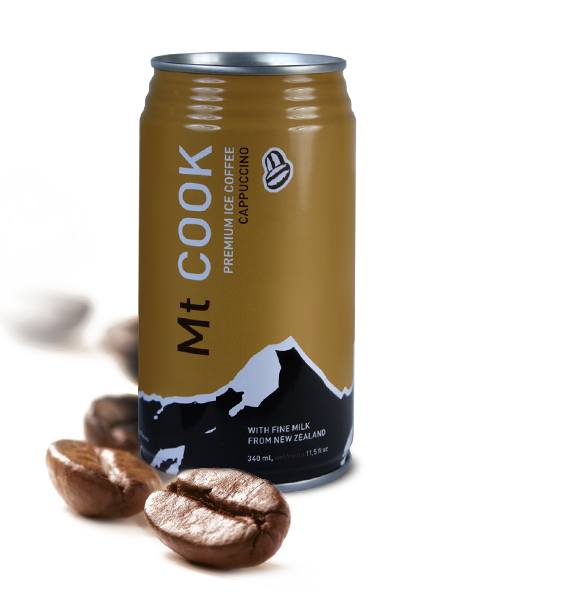 Experience the fresh, invigorating energy of Mt COOK Ice Coffee Cappuccino - a unique combination of ice and fire. Now everyone can enjoy this perfectly tuned taste in our new and improved, larger packaging. A gently spicy and sweet flavoured iced coffee with the unmistakable flavour of vanilla. 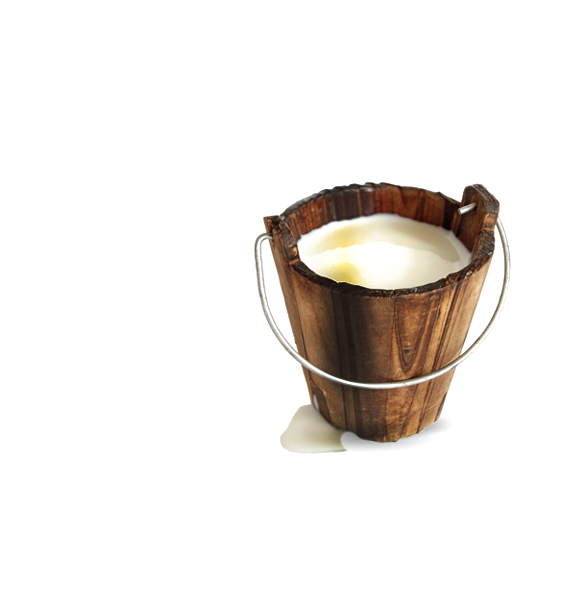 From a faraway place we bring you this exotic blend which captures the ice cold refreshing feel of the snow-capped peak of the sacred Mount Cook, together with a warm, soothing aroma of vanilla. 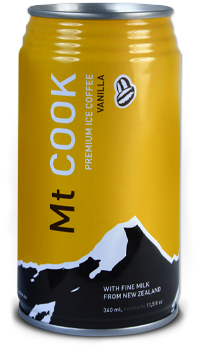 The clean energy of the glaciers of Mount Cook and that of the brave Maori warriors combines perfectly with aromatic vanilla in a balanced iced coffee with creamy soft milk from the cows of New Zealand. 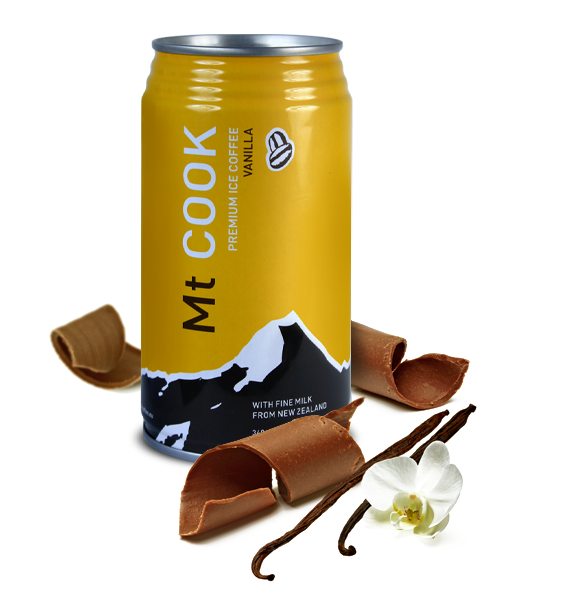 Try Mt COOK Ice Coffee Vanilla and you will see that it is much more than just a drink. It is an experience. Our distinctive packaging gives you a mouthwatering teaser of the delights that are hidden inside. Take your time and savour every last sip in style!